High Ranking Church Official Says That Heaven Is Full Of…Pets? A dog’s life is not nearly as long as a humans. In comparison they live roughly 1/5th as long as we do. The thought of losing them is enough to bring most pet parents to tears. But for those who believe in a higher power or more precisely, Heaven, there is good news. Rev. Kit Carlson from All Saints Episcopal tells WILX that she believes our pets are at “The Rainbow Bridge” waiting to lead us into the pearly gates. For those who are unfamiliar with the Rainbow Bridge story, it’s said to be a green meadow with a connecting bridge to Heaven. All the pets who have passed on become rejuvenated and healthy. They play with one another and wait until their owners also pass one, and when they do, they all cross the bridge into Heaven, together. Twenty six years ago former Pope John Paul II referenced Psalm 104 and said that “animals, too, have a breath or vital spirit received from God. In this regard, man, coming from God’s hands, appears in solidarity with all living beings.” Some supporters feel that he was in fact saying animals go to heaven. However, many others interpreted it as him saying that all animals have souls, but after death they cease to exist. Pope John Paul II never spoke about this issue again, which gives credence to the latter interpretation. 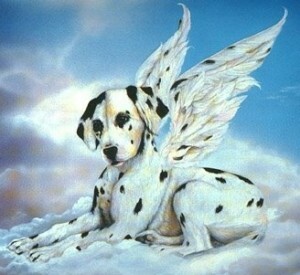 Do you believe that our dogs go to heaven? If not, what do you think happens to them? Comment below and don’t forget to share! ← Science Has Uncovered A Fat Gene In Dogs. Does Your Dog Have It?